When you’re the third-born of four kids, birthdays are kind of a conundrum. A conundrum at least for the person trying to figure out what to buy you when, between all of the children, there is nothing your family doesn’t own. Of course, as third-born, you mustn’t mind hand-me-downs (or ups). 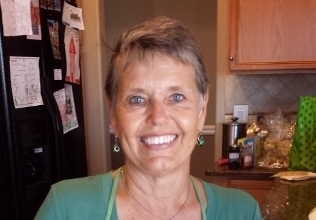 My sister Jen, herself a third-born of four kids, still talks about the trials and tribulations of being stuck in the lower middle half of the family. You would think she’d be over it now that she’s 696 months old. So, I put on my thinking cap back in early August when my third-born granddaughter Dagny celebrated her 9th birthday. I asked her mom for suggestions. A new bike helmet or a lunchbox for school, said she. Doesn’t that sound like the practical mom’s perfect birthday suggestions? I did go ahead and buy her a new helmet, because, well, she moved to a new bike helmet age group, and at least a helmet is used when doing something fun. I just couldn’t do a lunchbox. Too boring. I kept imagining Dagny’s face when she opened up the present only to see a lunch box and thermos, reminding her that summer was almost over and school would soon begin. Just what I wanted, Nana, she would say with a fake smile. Someplace to put my half-of-a-turkey sandwich and my fruit chews in the morning and someplace to bring my half-of-a-turkey sandwich with one bite out of it home again in the afternoon. But I remembered last winter when I asked Dagny (as I ask all of my grandkids) what she wanted for Christmas. Top of her list was to do something with me that didn’t include the other kids. Now that’s a third-born for you. I didn’t make that happen at Christmas because Bill and I leave Christmas Day for our winter in Arizona. But when I began thinking about her birthday, well, voila! So in addition to the bike helmet, I added a note saying I would take she and a friend to lunch anywhere she wanted, and then on to Jumpstreet. For those of you not familiar with Jumpstreet, it is an indoor trampoline park and all-around fun place for kids. You’re never too old to have fun at Jumpstreet is their slogan. That is, of course, not strictly true, which is why I offered to have Dagny invite a friend. The last time I jumped on a trampoline, I was seven years old and ended up in the hospital with a hernia. That, my friends, is a true story. So for my part, I enjoyed reading for two hours while they jumped to their hearts’ content. No hernia. 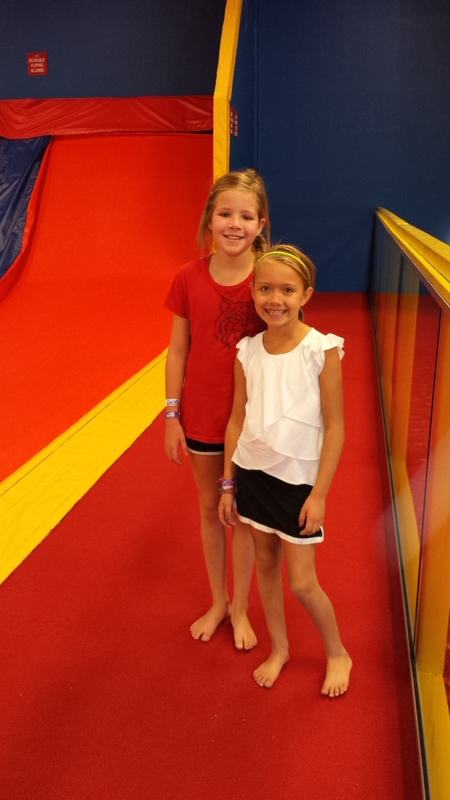 Dagny (right) and Brynn after two hours of nonstop jumping. Don’t they look pooped? For a month now, Dagny has been considering where she wanted me to take her for lunch. I told her the only restriction was distance. Money wasn’t a particular consideration. McCormick & Schmick’s? Nope, she doesn’t like seafood or fish. Benihana’s? No again because while she likes to watch them cook her food, she doesn’t particularly like the offerings. So where did we end up? Smashburger. Worked for me. I enjoyed my jalapeno Smashburger immensely. Dagny and her friend Brynn enjoyed their lunches as well, including enormous Oreo milkshakes. As an aside, they drank maybe a third of their shakes and then took them with them in a to-go cup to enjoy after Jumpstreet. Unfortunately, the inside of the yellow bug got hot enough to roast a pig, and their milkshakes didn’t quite survive. 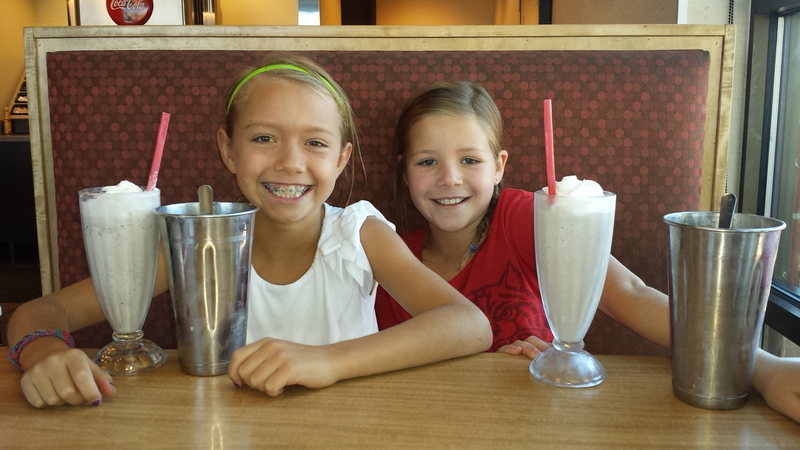 Dagny and her friend Brynn enjoy their Oreo milkshakes. I had a wonderful afternoon with the two fourth graders. I enjoyed hearing them talk about this, that, and the other. We had a fun discussion at lunch about their friendship, their siblings, their favorite subjects in school, and how their mommies and daddies met. Now that’s a subject for another blog post.